Almost every Sunday in our house is “Pancake Sunday.” Alex is off, so there are no alarms to wake us up. But, inevitably the boys still wake up early. So, the boys and I tiptoe into the kitchen and make pancakes while Alex sleeps in a bit. Of course, I brew a pot of coffee as soon as humanly possible. 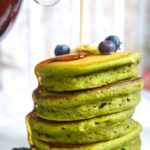 So when I was making these green pancakes as a test on a random Wednesday morning, the boys were confused. “Mommy, is daddy home today?” Ryan said, looking super confused. Owen ran into our room and yelled, “NO DADDY! ?” clearly as confused as his brother. Okay, so maybe pancakes need to just stick to Sundays. But the thing is, these are so good for you and also delicious that I don’t think they should be restricted to one day. 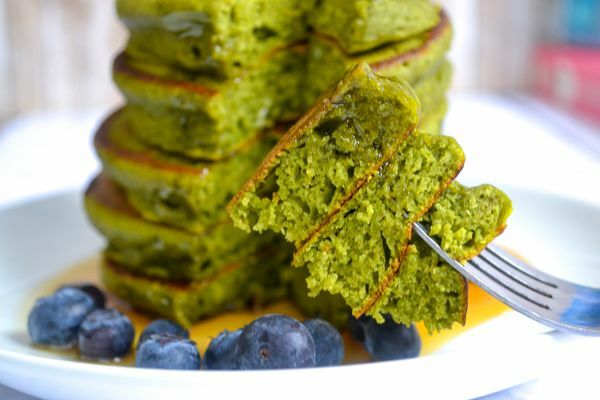 These spinach pancakes are packed with good-for-you stuff. You can also sub 1/4 of the flour out for an equal amount of oat flour. 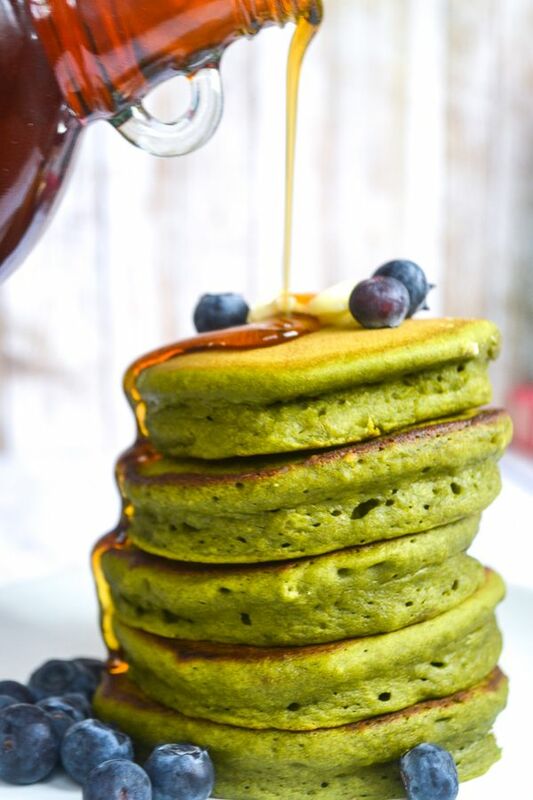 These green pancakes are lightly sweetened with breakfast favorite, maple syrup. This allows you to add more sweetness later when topping with your favorite maple-y goodness. One of my favorite pancake hacks is using a spring-loaded ice cream scoop to scoop batter. This helps make sure all pancakes are the same size and cook evenly. This is the scoop I use and love the most! I also use it to scoop muffins out and a smaller one for things like cookies and meatballs. 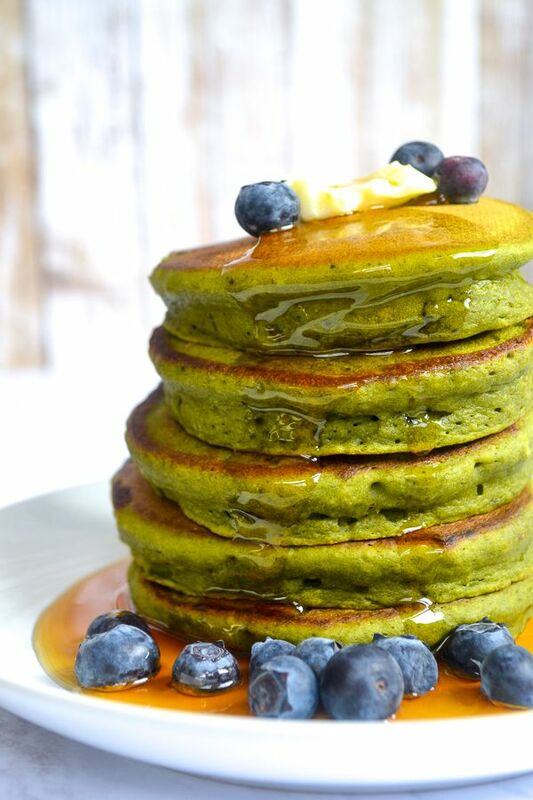 These green pancakes are going to be your new go-to breakfast recipe for kids. Packed with spinach and whole grains, there’s no guilt with this refined sugar recipe. If you enjoy this recipe, remember to vote 5 stars! It helps others find it and totally makes my day. Whisk together dry ingredients before folding in the wet. Mix until just combined – do not over mix. If your pan is not non stick, spray with cooking spray. Scoop batter evenly (about 1/3 cup) and cook 4-5 minutes or until the edges set and the pancakes begin to bubble in the center. Flip and cook another 3-4 minutes before serving immediately. 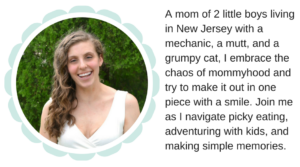 So, tell me – what’s your “special” day breakfast? Let me know in the comments!